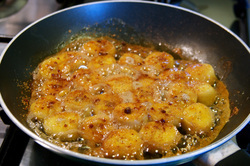 "Our Belize Vacation" - Belize Cooking Blog - Daisy Nunez "Our Belize Vacation"
Preheat oven to 375 degrees. Mix the cookie crumbs with the melted butter and press into a pie dish with your fingers. Bake for 8 minutes, remove and cool completely. Mix coffee granules into the rum until they are dissolved, set aside. Beat yolks with the condensed milk until light and fluffy. Stir in the icing sugar and the rum and coffee mixture. 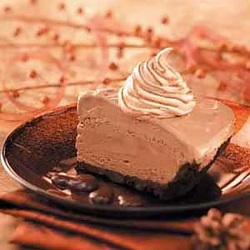 Pour into the pie crust and put into a preheated oven, 350 degrees for 30 minutes. Meanwhile, beat the egg whites, adding the cream of tartar, beat about 20 seconds. When the egg whites are starting to form soft peaks, gradually add the 1/2 cup of caster or granulated sugar. Continue beating until the mixture forms stiff peaks. When your pie has had 30 minutes in the oven, take it out, turn up the temperature to 400 degrees. Spread or pipe the egg white mixture over the top, bake for five minutes. Allow to cool, then place in the refrigerator for three to four hours. For extra luxury, serve with cream into which you have stirred a tablespoon of brown sugar and a tablespoon of rum. Put mango squash to boil. Add One Barrel, and add corn starch to get a thick glaze. Pour over grilled chicken breast. Garnish with cilantro and sliced mangos. Heat olive oil in a wok or deep frying pan. Add ginger, garlic, cayenne pepper, and salt. Cook for about one minute over medium heat until ginger and garlic brown slightly. Add shrimp, rum, fish sauce, and honey and turn heat to high. Stir and toss constantly until liquid has almost gone and ginger and garlic stick to shrimp; be careful not to overcook shrimp. Serve with coconut rice and fresh garden salad. Makes enough to serve 4. Mix all ingredients in a bowl and knead for a couple of minutes; if necessary, sprinkle with a small amount of water to make ingredients adhere to each other; dough must be hard, not sticky! Allow to rest in refrigerator for a minimum of 2 hours. Sprinkle leg of lamb with salt and pepper. Place with coconut oil in roasting pan, over high flame and allow to become brown and crispy, about 2 minutes. Mix bread crumbs with chopped parsley and roll the meat on this mixture while pushing it firmly. Roll salt dough to 1/2 inch thickness and place meat on it. Wrap salt dough all around meat and brush top with beaten egg yolks. Remove from oven and allow to rest on stove 9on top of oven) for 20 minutes before serving. Scoop carrots into small balls using a Parisian scoop. Boil for about 3 minutes. Heat coconut oil in separate pot. Add shredded coconut and allow to color slightly. Add carrots, sugar, and orange juice. Keep on high fire and stir constantly until all liquids are reduced. Reduce lamb stock with rum to one half of original amount. Stir in cold butter cubes. Mix egg yolks and flour until a firm but liquid dough forms; add hot water as needed. Drop small spoonfuls of dough into salted, boiling water. Cook spatzlis for 4 minutes and strain. Preheat oven to 350 degrees. Grease a baking sheet. Peel the breadfruit. Dice and mash the pulp. 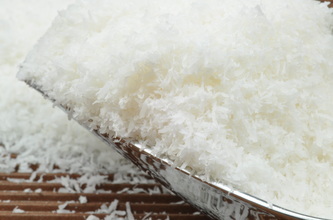 Sprinkle shredded coconut over diced breadfruit . Combine coconut milk, salt and sugar. Pour into prepared pan and bake for 15 minutes or until milk is absorbed. Serves 2-3 people. 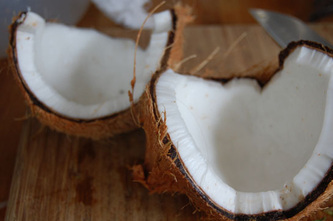 In a bowl, place grated coconut and cover it with the hot water. 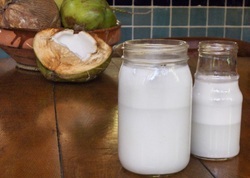 After coconut is soft, place contents into blender and mix. 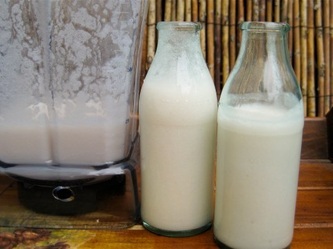 Then pour blender contents into a cheese cloth and squeeze by twisting until milk squeezes out. Beat pumpkin with sugar, spices, lemon juice and evaporated milk. Whisk cream until thick but not stiff, then fold into the pumpkin mixture with rum. Freeze ice cream mixture in plastic container until ready to serve. Stir three or four times while freezing; add raisins as mixture hardens. 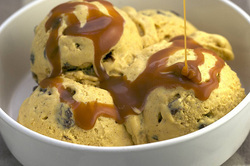 For optimum smoothness, freeze this mixture in an ice cream maker and follow the manufacturer's instructions for freezing. 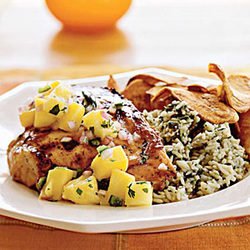 Grill chicken breast and simmer in pineapple saute for 2 minutes. Serve over your favorite rice. Saute onion, green pepper, garlic, salt, pepper, and soy sauce in vegetable oil. Flambe rum (take saute pan away from flame). Add diced pineapple, mango, and pineapple juice. Makes enough to serve 4. BELIZEAN BUTTER RUM RAISIN CAKE w/ RUM SAUCE - Delicious! Here's another one of my favorites. Hope you enjoy this, as much as I do. Pour rum over raisins and set aside. Cream butter until light and fluffy. Slowly add sugar and eggs, beating after each addition. Continue beating for 3-5 minutes. Fold in raisins with rum. Together sift flour, baking powder, and salt; stir them into batter. 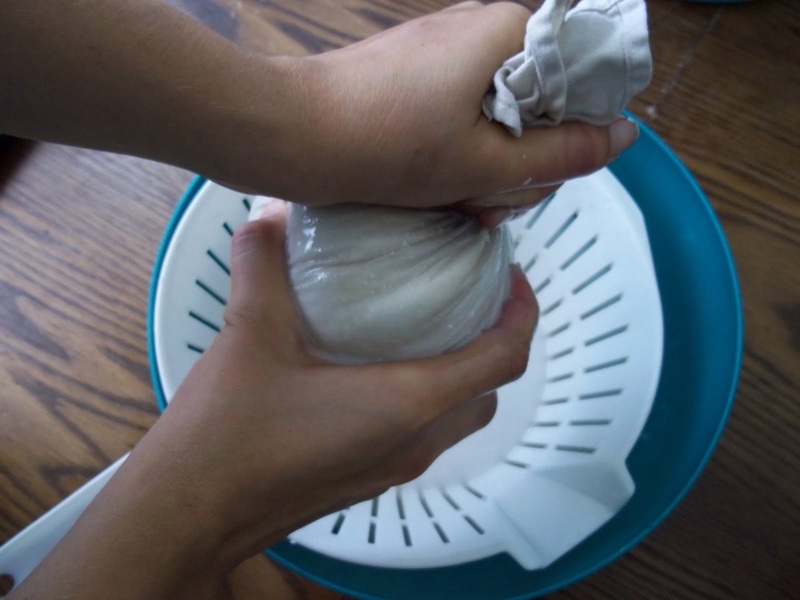 Pour into greased and floured baking tin. Bake in a preheated oven at 350 degrees for 35 minutes. Makes enough to serve 8. Place all ingredients except the rum into a blender and blend for one minute. Pour into a saucepan and place on stove over moderate heat; stir constantly but do not boil. Remove from heat and add rum. Pour a little rum sauce over each slice of your Butter Rum Raisin Cake when serving. Then wait for everyone to ask you for the recipe. Belizean's aren't big red meat eaters, but American's and Canadian's who come to visit are. Here's a great steak recipe, found in a few of the resorts in Belize. Combine all the ingredients in a baking dish. Add steaks and marinate in the refrigerator for 6 to 8 hours, turn steaks every 2 hours. Preheat grill until coals are gray/white. Oil grill, place steaks on grill 4 to 5 minutes each side; serve immediately. Makes enough to serve 6 people. In a bowl combine the lime juice, oil, ginger, garlic, and pepper flakes. 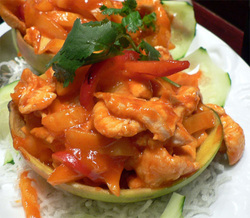 Add shrimp and pineapple, toss and let marinate abut 15 minutes. Remove from marinade. Cook in a pan over medium heat with a little of the marinade. Combine rum and onions. Bring to a boil and reduce heat and simmer until reduced to 3 tablespoons in volume, 3 to 4 minutes. With the heat on low/medium, whisk in the butter, 1 tablespoon at a time, adding each piece before the previous one has been completely incorporated. Continue until all the butter is incorporated and the sauce coats the back of a spoon. Remove from heat periodically to prevent the sauce from getting too hot and breaking. Season with salt and cayenne pepper and stir. Remove from heat and serve in a small bowl on the side (with your steak). Sprinkle sauce with cilantro. .
Cut the wings in 3 pieces, do not use the tips. Remove bone without disfiguring the shape of the wing. Chop spring onions and mix with soy sauce, jerk seasoning, coconut milk, and rum. Marinate wings for at least 30 minutes but overnight would be even better. Drain and dry the wings, dust them with flour, bathe them in the beaten eggs. Coat the wings with a mixture of coconut flakes, salt and pepper. Bake for 10 minutes in a 350 degree oven, drizzle with a mixture of honey and coconut oil while baking. Mix hone, lime juice, banana, rum, and mango pieces in a kitchen blender. Blend until you get a smooth thick sauce. Transfer to a mixing bowl, and add the green peppercorns, onion, jalapeno pepper and salt. Peel the cho chos, cut into strips and cook in water and salt for 10 minutes. Chill the cho chos in a cool water bath. Cut the melon in strips. Blend the olive oil, white wine, mustard, parsley, and onion. Mis with the fruits and veggies. Salt and pepper to taste. Makes enough to serve for a group of 5. For those of you who don't know what Chocho's are. 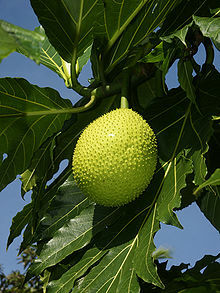 It is a Caribbean tropical fruit that is native to Belize, Mexico, Caribbean and Central America. The people of Belize, love Choco's. There are a few varieties; however they all have pear or slightly oval shape. 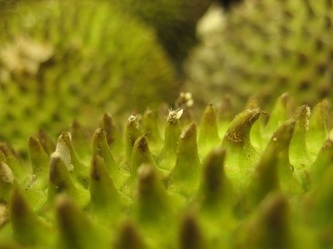 It carries a thin green skin fused with its flesh. 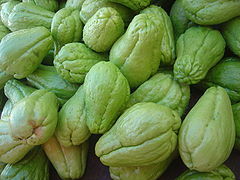 A Chocho can be used either as a fruit or a vegetable. Although this fruit has a bland taste, it is often eaten raw in salads and salsas, with lemon juice. When it is cooked, it has a taste like a cross between potato and cucumber. Hola, my name is Ms. Daisy. Welcome to Belize. 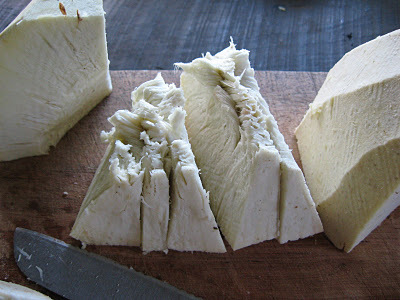 This blog is about all the Belizean foods and dishes that I love. Hopefully you can try some of these on your next Belize Vacation.